Kurt has performed on tenor trombone & bass trombone with the FLSO since 2004, and is a founding member of the orchestra. He grew up in Southern California, starting his musical training on piano at age 8, switching to trombone his freshman year of high school. Kurt earned a Bachelor’s Degree in Biology from U.C. Riverside, then ‘started over’ – receiving both B.A. & M.A. degrees in trombone performance from the University of Southern California. His teachers included Robert Marsteller, Lewis Van Haney, Terry Cravens, and Jeffrey Reynolds. Kurt’s first professional ‘gig’ was with the All-American College Band at Disney World in Orlando, Florida in 1974. 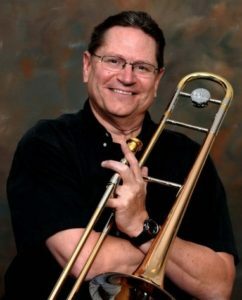 After several years freelancing in Los Angeles, Kurt was the Principal Bass Trombonist for the Shreveport Symphony, Opera, and Ballet in Louisiana, and the Longview Orchestra in Texas from 1982 -1990. Since returning to California, he has played bass trombone and lately, string bass, with the Camellia Orchestra (over 26 years). Kurt has also been a member of the Davis Brass and Fred Morgan and Buddy Harpham big bands. Lately, Kurt has added string bass to his portfolio, switching to the Camelia Symphony bass section as of 2014. He currently owns the Minuteman Press print shop in Midtown Sacramento (established 2010). Prior to that, he was a computer analyst for over 35 years. He is married to attorney Tonie Darling, with 2 grown sons (Nick & Ben), and lives in Land Park.